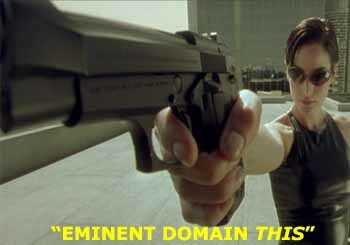 I have hated the entire concept of eminent domain ever since the state came to my father and made him sell some of his frontage property in order to put an off-ramp from the newly four-laned federal highway 45 back when I was a child. Sure, they paid “fair market price” for it, but it would have been all the same had it been land belonging to the family for a hundred years or the house he’d lived in all his life. It’s an abridgement of a fundamental citizen right…that to private property. However, because of a few black-robed morons in Washington, D.C., this right was extended to business development projects. This is a concept whose very utterance causes me to fly headlong into a raging fit…in fact, causing undue strain to the very keyboard upon which this is being composed due to the above-average typing force inflicted as a result of the anger festering within me because of it. To refresh your memory, Kelo V City of New London was a case from 2005 where the Supreme Court allowed a city to take non-blighted private property by eminent domain and transfer it to a private developer in an attempt to increase municipal revenues. This is an open door to further abuses on the part of local and state governments. In this case, ED isn’t just a problem for which medicine is advertised on cable news during prime time…it’s a dysfunction of the guarantee of individual rights against governmental oppression. Fortunately, President Bush issued an executive order that would prevent the national government from straying from constitutional boundaries set in the Fifth Amendment’s Takings Clause…not that it couldn’t or won’t be overruled at some point, at least it’s something. Here in Mississippi, the state legislature was going to pass a law that would have done much of the same thing…forbidding the exercise of eminent domain for private enterprise. But our esteemed Governor Mush-Mouth decided to veto the law from going into effect in an effort to make the state more attractive to economic development by offering businesses who might want to relocate here a bone. Frankly, any business who would take them up on such an offer is frankly one I’d rather see go bankrupt. The veto wasn’t overridden because of the fops in the legislature who have the governor’s hand up their behinds like so many puppets. So now he wants them to reconvene and pass a law allowing such eminent domain processes under allegedly strict limitations. May he and his sycophants all get a nasty case of gonorrhea with overactive bladder. What I see here is yet another slippery slope, another loophole we do not need before some nutbar gets in charge and begins taking advantage of the legal precedents being foolishly set. I doubt my home place will ever be scouted for some grand development scheme at any point in the future, but it’s not worth letting it happen to others for the sake of a possibility of attracting jobs we’d never even miss without the infringement. Back to the Supreme Court case, they never used the land condemned in New London, Conneticutt, which currently are generating zero dollars in revenue to the city. This was after the plaintiffs moved out after being hit with rental fees from the city for living in THEIR OWN HOUSES. And those people are still displaced from their rightful homes and embittered against those responsible to the point of forming a political party in efforts to take control of the city council.